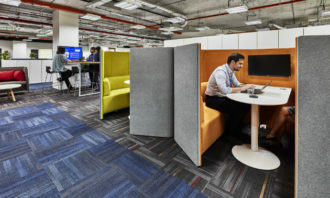 Located in Mountbatten and unveiled in October 2018, innovative office was designed with input from employees, combining a balanced combination of hardware (a comprehensive suite of smart technologies) and heartware (the most flexible working arrangements) to improve every employee’s quality of life. 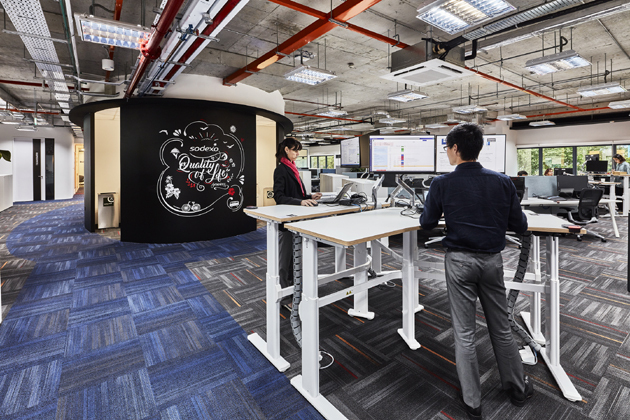 The 10,000 sqft workspace houses 130 staff from Sodexo’s APAC team. 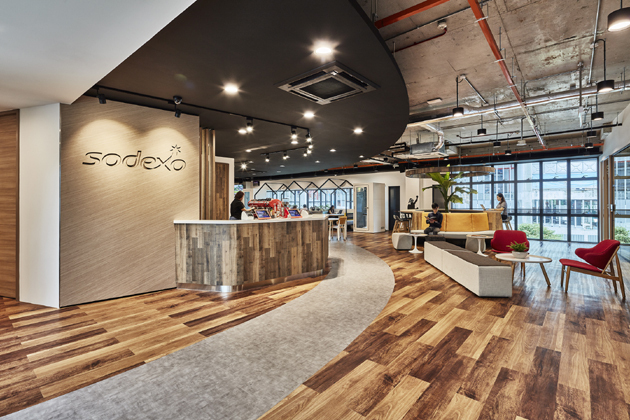 A bright, cheery entrance greets employees and visitors of Sodexo APAC House. Instead of signing in with a receptionist, guests register through a fuss-free digital system that informs the host of his or her arrival. 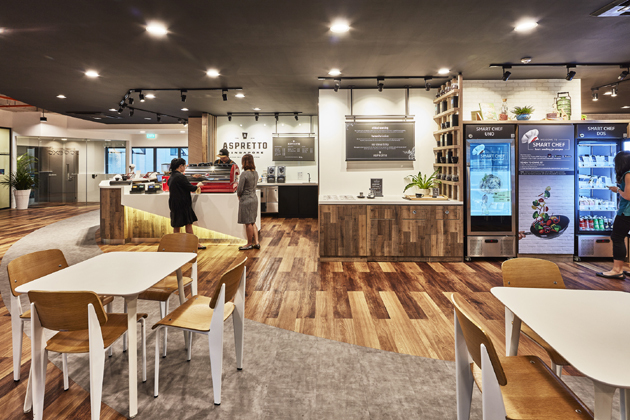 Upon entry, employees are greeted by ASPRETTO, sustainable café where baristas, including students from Mountbatten Vocational School, serve up warm greetings and fair trade brews to kick start the day. 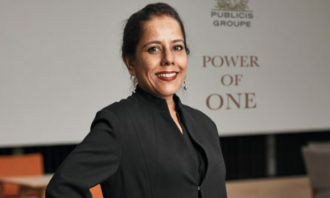 Proceeds from the sale of drinks go towards Stop Hunger, a non-profit organisation set up by Sodexo employees in 1996 to fight hunger and malnutrition around the world. 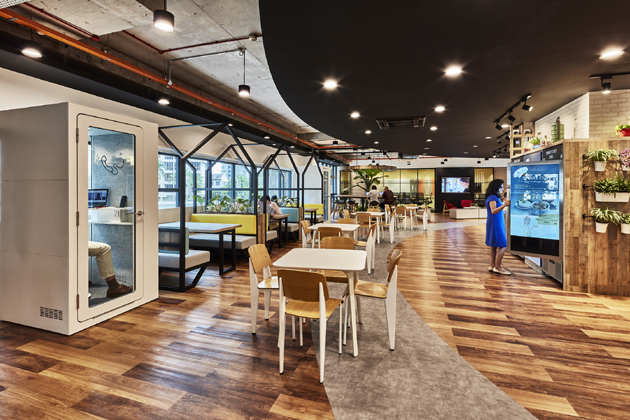 Venturing further into the workspace, employees step into The Xchange, a vibrant social space where they unwind, hold discussions and enjoy their hot meals and beverages. 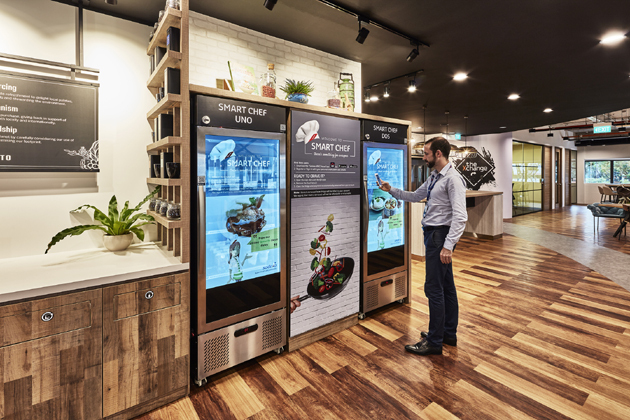 Here, employees are able to gain easy access to fresh wholesome foods via the Smart Chef RFID fridges which are connected to automated RFID smart kiosk as well as Sodexo’s Smart Chef mobile app. Employees can use the app to peruse the menu, unlock the fridge and pay for their items without using cash. Moving further inwards, the APAC House’s Activity Based Working (ABW) concept accommodates a myriad of working styles and preferences including hot desking, focus pods, multiple discussion nooks, and an ideation room – The Lab – decked with an interactive touch screen, TVs and flexible furniture. Throughout the office, height adjustable desks provide greater comfort and promote better health. 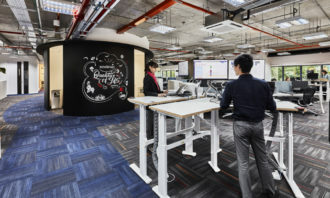 In facilities management, Sodexo’s IoT platform links up more than 200 sensors to provide intelligent insights, drive automated actions and send alerts to improve efficiency and comfort. 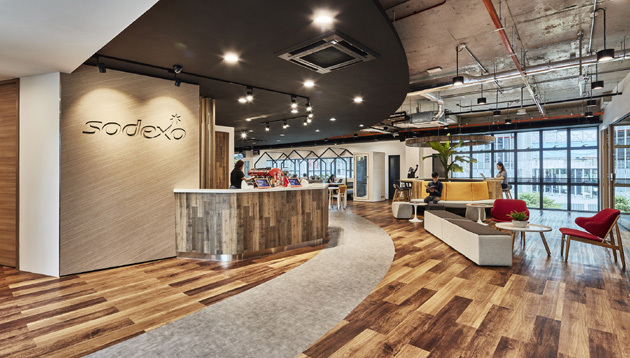 From the entrance to the bathrooms, Sodexo’s new office is an intuitive space powered by innovative technologies, with a comprehensive suite of features is implemented in this new office. 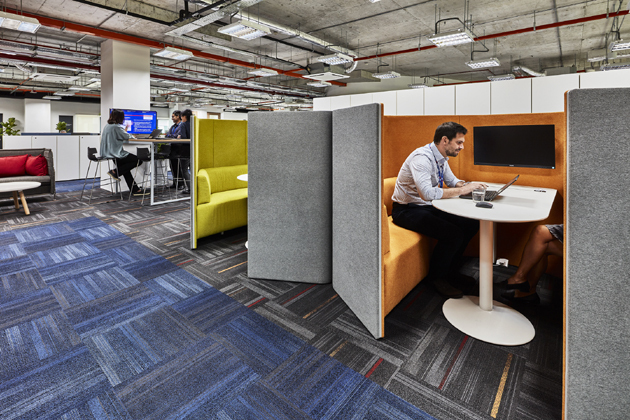 To ensure space optimisation and wellbeing, occupancy sensors and comfort sensors (for temperature, humidity, air quality, etc.) 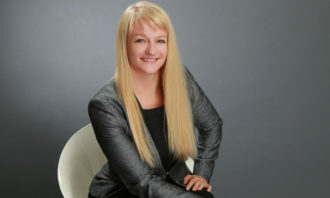 allow the team to monitor space use and wellbeing of co-workers. These sensors also trigger alerts for maintenance when required, reducing redundancies in servicing. 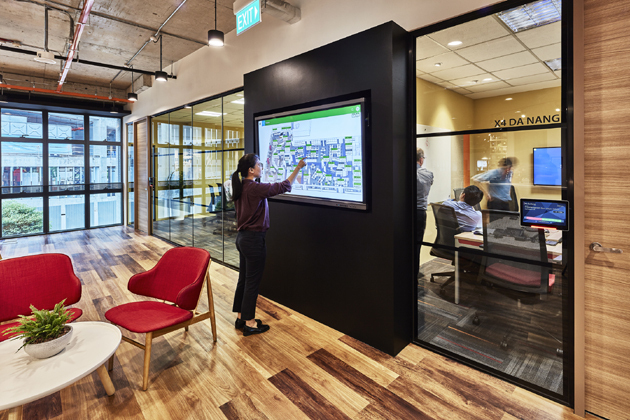 A digital dashboard shows at a glance which rooms are being occupied, temperature at various parts of the office and energy usage in real-time. Sensors which turn Air-conditioning and lights in meeting rooms turn on when people enter, and switch off when the space is unoccupied. Automated temperature settings where the optimum temperature across the office is set at a comfortable 24 deg C. Any variations to this set-point will trigger an automatic update to correct the temperature. 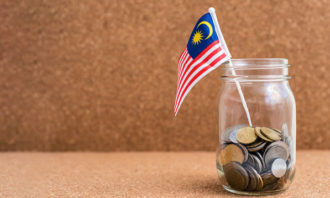 Real-time building energy management which showcases the historic trends of energy usage and specific strategic asset classes of electrical distribution. Remote Tracking which provides for remote tracking 24/7 by Sodexo’s facilities management experts. 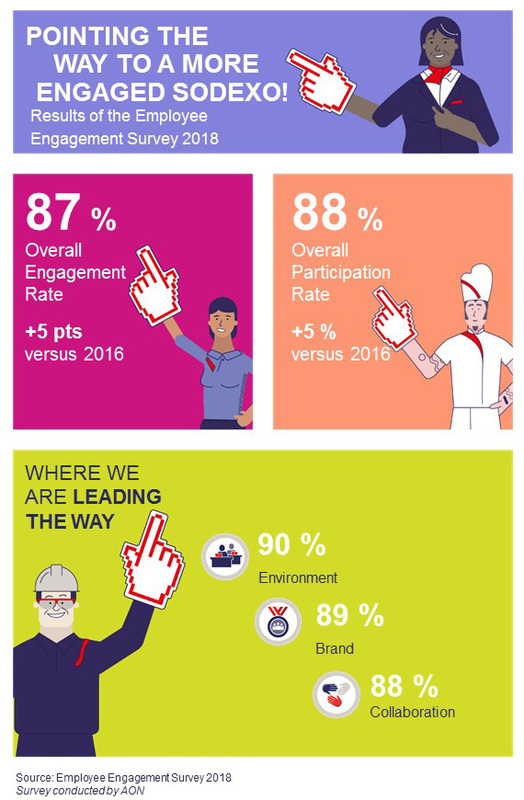 According to Sodexo Group’s global Employee Engagement Survey 2018 conducted by an independent research firm, Sodexo APAC reported an engagement level of 87%, the highest among all regions. 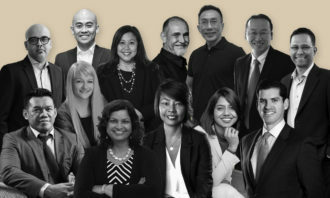 The APAC House is yet another collective effort by Sodexo to engage employees, retain talent and to showcase the future of workplace and food solutions.